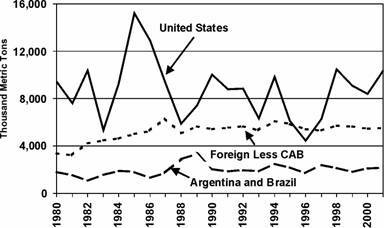 Domestic demand for soybean complex (soybeans, soybean oil and soybean meal) among foreign less CAB nations (foreign less China, Argentina, and Brazil) has continued its strong upward trend during the 1990s averaging between 5 and 6 percent annual growth. At the same time the year-end carryover levels for these foreign less CAB nations have held extremely steady, varying by no more than 5 freighter loads on either side of its 5.25 million metric tons median level. In looking at figure 1, it becomes clear that these overseas purchasers of soybeans and soybean meal and oil have listened to the Harvard MBA’s admonitions about arranging for just-in-time delivery. For the most part they do not stock up when the prices are low nor do they hold off on purchases when prices are high. They order just what they need at the time they need it. Just-in-time ordering requires just in time production by suppliers. In many non-agricultural industries, this works fairly well as producers endeavor to reduce inventory-capital requirements up and down the supply chain. Precision agriculture may help the farmer apply field inputs in a carefully controlled manner, but the last time I checked no one has developed a precision production process for crop agriculture. Farmers still put the seed into the ground and then pray for favorable growing and harvesting conditions. Depending upon the vagaries of weather a farmer’s production can range from a complete crop failure to a record harvest. In addition farmers have to make production decisions six to nine months in advance of harvest and a year or more in advance of the sale of the crop. Just-in-time production does not exist in crop agriculture. A look at figure 1 makes it clear that for the soybean complex, the United States is the world’s residual supplier as we also have seen to be the case for corn. While the carryover levels of both our major soybean competitors (Argentina and Brazil) and our non-China customers vary from a median by ± 5 freighter loads, US carryover levels vary by over seven times that amount (±37 freighter loads).